Part of I-70 was copletely closed for the weekend so that crews could set beams for a new flyover ramp as part of the Central70 project. DENVER — Businesses around the Central70 project are trying to stay positive and find creative ways to draw in customers through detours and construction headaches. 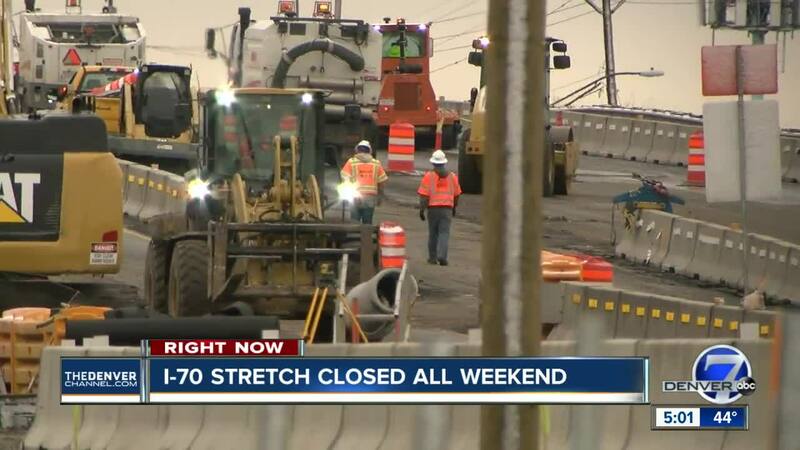 Part of I-70 was completely closed this weekend between Colorado Boulevard and I-270 while Colorado Department of Transportation crews installed the bridge beams for the new flyover ramp that will take drivers from southbound I-270 to eastbound I-70. The highway was completely closed in the area starting Friday night and will stay that way for the entire weekend. For the co-owners of Rare Finds Warehouse, which rests right along I-70, there’s been a lot of uncertainty lately. The furniture store was busy as usual Saturday morning with the bell attached to the front door pinging every few minutes as new customers walked inside. Still, businesses and residents in the area are worried that this project will go beyond the targeted 2020 completion date. “They say it’s going to be a certain amount of time, but I grew up here and I watched the T-REX project take a lot longer than it was supposed to take, so we’ll see,” Wilson said with a laugh. In an effort to encourage people to come in despite the detours, the store is offering sales throughout the weekend. He’s also hoping the detour might bring new customers in since Stapleton Road runs right next to I-70 and is the detour route some cars are being forced to take. Rare Finds is also looking to open up another store in Highlands Ranch soon right off of C-470, where another C-DOT construction project is still underway. Wilson is hoping that one will wrap up soon so that if business slows down at the current store, the Highlands Ranch location can make up for it. “We’re very optimistic and hopeful that it will work out for us,” Wilson said. I-70 between Colorado Boulevard and I-270 is set to reopen around 5:30 a.m. on Monday morning, just in time for the morning commute.